1. What is one CHEAP TRICK that you can’t stand or have problems with? CHEAP TRICK implies some method or element that is used towards some effect or end, whether explicitly or just in your head. It also implies that it worked on you at least once before you got wise of it. Poorly executed emotional manipulation. Already explained here, but to say it again, it’s not a problem for me if I know my emotions are being milked, as long as I can generally care for these characters/moments that I’m told to by the show; I’m fairly lax with that. But if I start getting annoyed by various aspects, like how heavy-handed some shows can be with this (I’m looking at you, AIR) or if there’s bad writing/setup, it turns me off from thoroughly enjoying a show. 2. What is one CHEAP TRICK that still gets you every time? For example, maybe some sad girls in the snow make you tear up no matter how lame you think the actual story is. Or maybe there’s that one voice actor or artist on board that makes a product a must-watch/read/play for you, regardless of the overall quality. 3. What was one scene in an anime/manga/game/novel/etc. that conveyed it’s emotion so strongly that your own feelings were caught up in it? Grief, relief, joy, depression, fear, or of course rage. Note that this is different from your reaction to something outside of the in-story emotional content, like raging at a terribly written plot development or BEST GIRL not getting her deserved ending, unless the characters themselves express the same emotion. One that comes to mind for me is (surprisingly?) 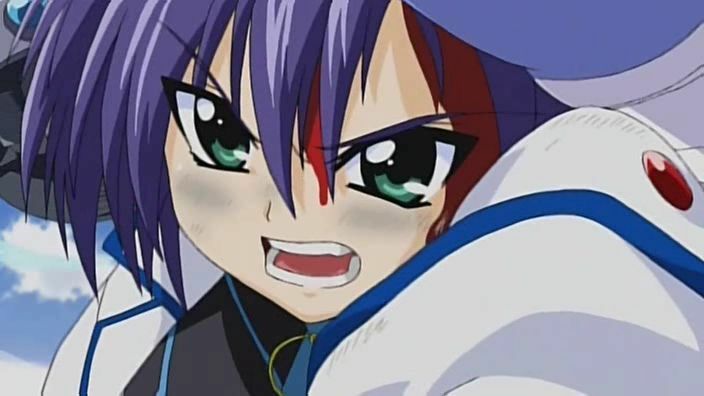 when Subaru loses it in episode 17 of Nanoha StrikerS after finding her sister unexpectedly looking pretty much near beaten to death by the Combat Cyborgs. The series up until that point didn’t really hit home for me, but it built up some things well, such as the relationship between the Nakajima sisters. That I also felt the same rage that Subaru did at that moment helped make that “wham” episode a big one, especially when coupled with the devastation of Riot Force Six and a critical kidnapping, among other things. It definitely make me look forward to the rest of the series, at that time. 4. BONUS QUESTION: Thanksgiving Times (optional) – What’s one thing you’re thankful for this year/season/week/day/moment? Always thankful that I’m still alive, that all my immediate family is alive, that all my friends are alive at this point in time, and so on. For something more materialistic, I’m grateful that I’m able to still find some time to watch some anime this year, no matter how little. As for people to tag, my comrade dm_7 and (of course?) laundry detergent omo would me tagging targets here, but it doesn’t bother me too much here if they don’t do so.